Imagine, just for a moment, that you’re Steven Tyler. (If you can’t quite get there on your own, try wrapping a scarf around your neck and restricting oxygen flow until the sweet emotions start to flow.) It’s 1999, and the Armageddon soundtrack has just propelled you back to the top as the lead singer of Aerosmith, the Disney theme park ride of internationally famous rock bands. And so, it’s only fitting that when the Imagineers at The House Of Mouse offered to actually turn you and your bandmates into a ride for their Walt Disney World Resort, you quickly said yes. And yet, as filming day for the ride’s pre-launch video approaches, some doubts still float in your mind, as bloated and terrifying as Bruce Willis’ corpse, bouncing around in the depths of space while “I Don’t Want To Miss A Thing” echoes forever in his irradiated ears. “Is this really metal?” you ask yourself, as you get into your Aerosmith costume and shake hands with Illeana Douglas, who’s playing your manager in a cheap piece of fiction designed to keep bored, sticky families entertained as they wait to be loaded into fake roller coaster limousines. “Am I selling out?” It haunts you, like the love you once shared for a certain elevator, so many years ago. And so, when the moment comes, you lash out at the clinical safety of corporate fun, at the commodification of rock. At a critical moment, you bend back your ring finger, and instead of simply shielding your eyes, you throw out the shocker to your fans. And that’s when we hit the emergency abort button on this mental exercise, lest we accidentally inception our readers with a duplicate Steve Tyler permanently lurking in the back of their brains, leering at the other neurons and futilely trying to get American Idol back on the air. The facts are, for more than 15 years, Disney World’s “Rock ‘n’ Roller Coaster Starring Aerosmith” has featured footage of Tyler throwing the shocker—the frat boy hand gesture of imagined sexual efficiency— at his fans, and also any kids who happened to be in the audience. And someone at Disney apparently (finally) noticed. According to theme park blog Inside The Magic, Tyler’s gesture—an open secret for years, if all the videos of it online are any indication—has been replaced, digitally altered to simply show him raising his hand. 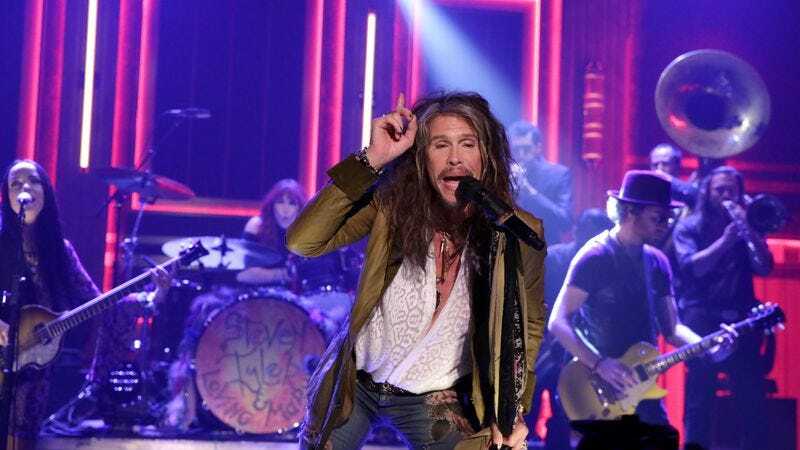 Disney hasn’t issued a comment on the change, but presumably, somewhere in an accessory-strewn mansion, Steven Tyler just shuddered, as his last act of heavy metal defiance was retroactively erased.